Docking the user controls inside RadDock. Implementing events, methods and properties in the user controls which allow you to have communication between the forms/user controls. In our particular case we dock a user control instance inside a RadDock instance. The user control itself contains a RadCalendar. When the user clicks the RadCalendar a custom DateChanged event for the UserControl1 fires, showing a dialog with the selected date. Using this as a model you can create UserControls with custom properties, methods and events for more complex situations. 1. In Visual Studio create a new Windows Application. 2. Create a new UserControl - from the Solution Explorer, right-click the project node in the Solution Explorer and select "Add >> UserControl...". Name the new user control CalendarPanel. 3. Drop a RadCalendar on the CalendarPanel design surface. 4. Set the RadCalendar.Dock property to Fill. 5. In the Property Window locate the SelectionChanged event and double-click it to create an event handler. 7. In the Solution Explorer, double-click the main form to open its design surface. 8. Drop a RadDock on the opened design surface. Set the Dock property to Fill. 11. Press F5 to run the application. 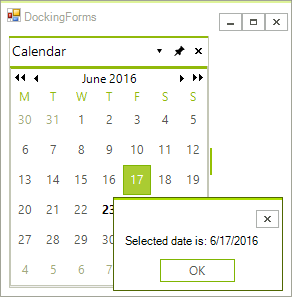 Click the cells in the calendar to display the date in a message dialog.